That's awesome to hear, you are lucky my friend and I'm happy you were able to get that now very elusive experience. I don't really want to support a company/business that enables this, and the Porsche today is not the Porsche I grew up admiring and hoping one day I could own one of their cars. 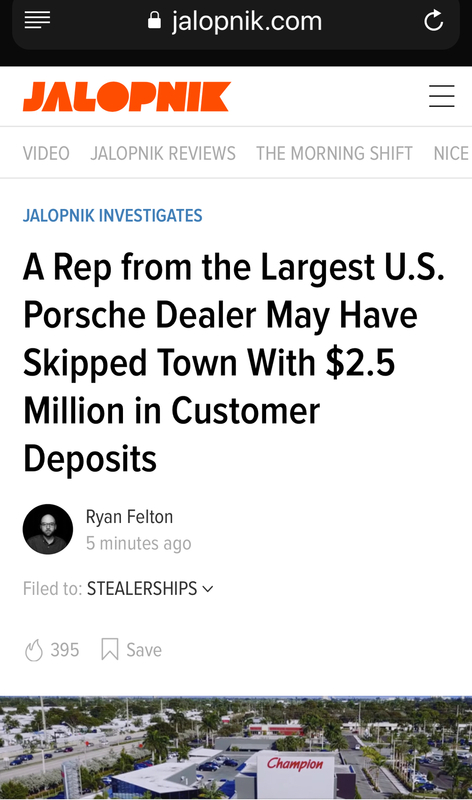 It's infuriating to me PCNA's approach of just letting the US dealers run wild and we see this happen. We see people who were told MSRP to be shown the door while we have 100+ of 991 GTxxx cars rotting on the showroom and inbound at big ADMs. Even servicing my GT3 has turned into an unpleasant experience to my surprise and I'm staring down the barrel of a massive ADM/likely games for a 992.1 GT3 if I want to get into that. Already. With the car 3-4 years away. The market I am in doesn't help either I'm keenly aware of that, but I don't think I want to move for a car manufacturer. I'm just one guy and just a fart in the proverbial hurricane but I'm really turned off by how Porsche has handled the 991 GT system. I used to love them for being the anti-Ferrari no-nonsense car company, but now Ferrari and McLaren are trying to market themselves to me as the anti-Porsche! GT cars are the last NA cars PAG makes, and if you want Euro Delivery/spec the car the way you want the only way to do that is ADM or start buying Macans and Panameras. If there was an easier way we'd all go that route. Or you are saying walk away from Porsche/GT cars which is the path I am considering now... & I squarely blame Porsche/PCNA completely. They use GT cars to incentivize sales for US dealers? They know what's going on and by staying silent and letting the dealers do as they please they are effectively supporting these BS practices. All I know is that we NEED to be very careful moving forward of those car FLIPPERS of any brand and model. They come from all walks of life. Your holiness, I agree with you but Porsche has full control over ADM, it was just too convenient to keep things this way. There is a lot of shady stuff going on between brokers and dealers which some buyers will get mixed up with. I agree. The more I think about it, I wouldn't be surprised if there is an existing syndicate operating in that fashion? Sadly, that seems to be the case. There appear to be some that are able to get spec'able GT* allocations at MSRP without buying more mundane stuff, but they are exceptions that often have associated stories. From a business perspective it makes complete sense that dealers do this. See guys ...CHAMPION DID KNOW about the 991R fraud case against Shiraaz. See Jalopnik article. Champion settled and shell company Rampage was known to Champion. Shady. What do you say critics? Last edited by STG; 09-14-2018 at 05:25 PM. It has been shown in the court documents that this guy's scams date back to at least 2 years ago. And that the fictitious company he used to accomplish this was registered in 2010. This was going on before the owner died. How many people are heading over to Champion to buy a car today...? Bueller...? Bueller...? They will say that they're also a victim in this and try to get sympathy. We were taken advantage of (when really we knew how shady this guy was for years). It was only those sports car guys who were affected by this. Don't worry your Cayenne, Panamera and Macan deals are safe with us. The average FL snowbird and Miami local will know little about this or care. The enthusiasts on the other hand hopefully have higher standards. I will order a "Trabant" from Champion. I heard they are not charging ADM any longer.